The other day I was writing about "Migration" for final documents that are required by the Art in Public Places. In describing the nature of the installation, I was reminded that because all the elements are tensioned together, to touch one is to affect others. This, remarkably, is called "The Butterfly Effect." While I had known about this prior to the commission, I never once thought about it until the end. I only thought about the majesty of the Monarch Migration and the technical aspects of the installation. Further, even before it's completion, my friend Kathy Rushford, a thirty-year veteran of a middle school, and I had decided that the subject was so rich that we had to pursue creating a book. There are other books, but we have something unique in mind. Not cute, but scary and challenging and targeting teens. Michael Strange from the Sacramento Library arrived with his camera to take some pictures. Chris Noll, the talented architect on the project was visiting. After many months of design, research, fabrication and installation, "Migration" is complete. If you are still you can see the butterflies move. The more still you are, the more you can see them move. Cast shadows on the walls are subtle but enchanting. The grand opening celebration is tomorrow at 9:30am. Click here for info. As I've mentioned in previous blogs, the story of the monarch migration is endlessly engrossing. It has inspired me to explore the idea of creating a book. I'm partnering with my dear friend, Kathy Rushford, a brilliant teacher who has 30 years experience with middle school children. This won't be a sweet, cute children's book but rather an illustrated "graphic" novel as seen through the eyes of one special "hero" butterfly. The real story of the migration provides rich fodder for "cliff-hangers" and wild explorations that our hero would likely encounter on his 2,000 mile migration from Canada to Mexico. The librarians at Valley Hi have been very encouraging and I'm looking forward to their advice. A group of butterflies is called a swarm or a rabble or even sometimes, a kaleidoscope which I prefer. Last Thursday I had a visit from an adorable little girl. Attracted by the butterflies, she wandered over. She was curious. She had a white bow on the top of her head, tied to long, dark hair and a dress covered in colorful flowers. She stood at the base of the scaffolding, longing to climb and declared her admiration for the butterflies. She was amazed that I had made them all, and flabbergasted when I told her I had made 2,000. I asked her what she thought about when looking at them and she began to tell me her story about them. I stopped her and asked her to write the story instead and this is what she wrote. I also had a visit from the head architect, Christopher Noll of Noll & Tam in Berkeley. As he's insured, he did come up with me. He was really happy with the installation which made me feel great as he's designed an amazing building and I feel privileged to participate. There is an open house event on August 29th. Please join us in celebrating this very green addition to Sacramento's impressive collection of public buildings. Besides Celeste's charming story, I've been reading a wonderful travelog called "Chasing Monarchs," by Robert Michael Pyle. I quoted a section in the prior blog. He's a terrific writer with endless patience for following monarchs even when there aren't any. He started in the state of Washington and discusses various factors that influence Monarch behavior as he encounters them. So far he has mentioned herbicides, nuclear power plants, dams, sun compasses, magnetic fields, landforms, rivers, highways, mimicry, toxicity, lava flows, waterfalls, flower farms, the aerodynamics of gliding and John C. Fremont who passed through the same areas in 1863. He wrote about his experiences extensively, and as my next project is for Fremont Park on 16th, I'll be reading him soon. (See my blog on that project). My buddy George Hauptman joined me again last Friday. He's 6'6" and can reach areas that I can't reach. I've known him for years and it's great to spend some time with him. He's a very gentle person and so good with butterflies. The story of the migration of the Monarchs is becoming more compelling to me. My natural curiosity has been accelerating. I've bought two books, "Chasing Monarchs," by Robert Michael Pyle and "Four Wings and a Prayer," by Sue Halpern. It was even difficult deciding which to start with so I picked up the former and was so mesmerized by the first paragraph that I couldn't put it down. This morning when I arrived, a tiny bit of sun sneaked in from the East window, casting it's illumination on just a few butterflies. Later in the day, Jason Loring, the HVAC mechanical guy came for a visit. He's from South Boston and wanted to see if I was wearing my Harvard tee shirt. I was so he stayed for a chat. The end of the 9th day. On Tuesday, July 28th, I climbed up to my new home. The main cables are ready and more will be installed as the piece progresses. It's not possible to plan ahead as the whole process is very spontaneous. It was slightly overwhelming to look at this empty space and try to visualize how it's going to look at the end of one week, then another week and yet another. At the end of the day there were enough elements attached that I could start to get a feel as to what lays ahead. I've brought a fraction of the pieces. At night I'll go home and attach more wires and link more elements. Each day that passes accumulates more butterflies. It's as if they've actually flown into the space. The ambient air moves them. The light changes as the sun moves around the building but not much as no sun penetrates the space. A moment of brilliance inspired me to call my friend George Hauptman, husband of Harumi Lanier-Hauptman, a very talented interior designer. George is very tall. He can touch an 8' ceiling. Standing on a ladder on scaffolding can be dangerous and as the floor of the scaffold is still 9' from the ceiling, George's help is critical. Here I have one hand gripping his pocket and the other on his ladder as he reaches to a far corner. The end of the day on August 3rd, shows the movement of the butterflies with the air. Two really nice young guys who are unpacking hundreds of boxes filled with thousands of books are visiting the space. 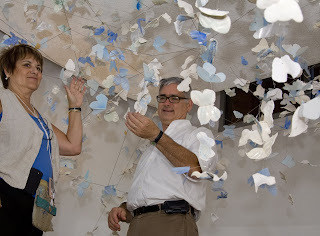 By the end of May, I'd made 1,000 ceramic butterflies and 1,000 fiberglass fabric butterflies. That's so many that I'm wondering what kind of person would actually do something like this. Remarkably, I find it quite soothing to make small repetitive elements. Each ceramic element has some kind of mark as do most of the fabric elements. Next comes the wire phase when I attach wires to each element, sometimes linking them together. On Monday, July 27th, the installer from Skyline Scaffolding arrived. It was a tight sqeeze to fit two 5x10' towers into the space between the benches. But it worked. This will be my home for the next several weeks. See the concept phase in the prior post below. Have you ever been to a Butterfly House? My first experience was in Vienna, 2000, and the second was in St. Louis, 2007. First, you enter into a tiny barrier space, and then into a warm, humid, atmosphere filled with exotic plants....and butterfies. They are everywhere, and they land all over everyone. It's the most magical experience. I came home this afternoon, turned on KVIE to the most glorious Nova special on Monarch butterflies. Do yourself a favor. Take an hour, yes, almost an hour, to watch the video on line. If you have a mac, you can still download the Windows software. To quote the director, Nick de Pencier, who has a fascinating story all by himself, the journey is about the "mythic, magical quality of the migration." I've been making butterflies. Of course, they won't fly on their own, and they certainly won't be making a 2,000 mile migration to Mexico. A caterpillar sheds skin 4 times & on the 5th becomes a crystallis for 10 days and then a butterfly, emerging to dry it's wings. Then 100 million butterflies migrate from southern Canada over 2,000 miles south, over the Great Lakes, deserts, into Mexico, down the Sierra Madres, to the Michoacan and Mexico reserves, over 2 months at 50 miles/day. No one knows how they do this, or how they fly back. Some fly to other places, like Santa Cruz, but the Mexican migration is the longest, most impressive. They cluster in forests to stay over the 5 coldest months, and then turn around, fly off again, mating and dying and birthing for three more generations, until they reach Canada again. It's a singularly unique event in the entire animal kingdom. Vienna, as well as the intimate and curved shape of the space. The ambient air moving through will cause the suspended and tensioned elements to quiver gently. The Sacramento Metropolitan Arts Commission chooses three artists to compete for each space. We each submit a written concept paper and a scale model. 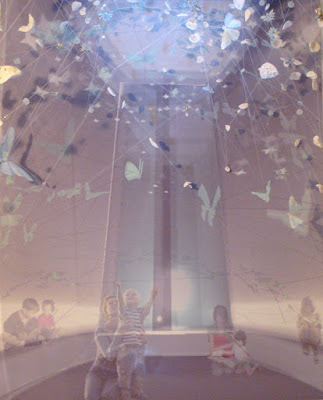 This image is of the model where I suspended tiny ceramic elements and beads to represent the butterflies. I've been making butterflies for awhile now. The activity falls under the heading of obsessive-compulsive behavior, which is fine with me because there's no other way when I have so very many to make. Each basic shape is rolled and cut by hand- what else? Then I have a collection of stamps that I've made from my family's silver. I like the idea of using images from past generations to come into contemporary time. I used the same stamps on the Scott's installation. Adding subtle color also emphasizes the patterns on the stamps and other spontaneous marks. Loading the kiln, and firing. A few hundred down, thousands to go. Yesterday, I made my second site visit to the Library project. The outside of the building is wrapped now so the spaces are more easily comprehended. This is the approach into the Children's Room. I brought a test sample of butterflies to hang in the space which has a large window looking West. The exterior wall wraps around just far enough to shelter the room from the summer setting sun. The is a LEED building, with many impressive green features. We discussed issues such as sheet metal reinforcement between the metal studs, lighting height and specs, and the date that the contractor expects to turn the building over to the client, the City of Sacramento. This combined image is a process by which I'll decide where to install the hardware on the walls and on the soffit above. I'll be adding measurements for the contractor to show him where I want the sheet metal to be installed. Drywall curves over the metal, and then the very elegant museum quality tensioning devices will be installed. From each of these, placed all around the walls and on the soffit, 17'4" from the floor, steel cable will be tensioned diagonally from one side to the other, like a cocoon. 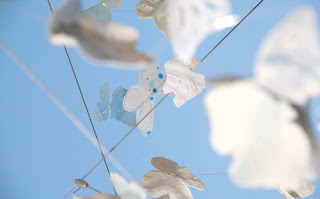 The ceramic butterflies and elements will attach to the cables and to the wall surfaces. Back to the studio, testing on the wall. The contractor has installed the reinforcement, and the drywall starts today. This week's New Yorker shows a butterfly visiting a construction worker on a high rise. Nice. I made a visit to the site to spend some time contemplating the space and talked to the architect for awhile. The building is stunning. The entrance is on the East side, so to get to the Children's Tower you pass through the entire length of the building, past soaring north windows, exposed construction and natural materials. A lower portion of the hallway hides the ventilation system that feeds into the Tower. My installation will start on that ceiling, about 6' from the open entrance. Once inside, the installation will be suspended from steel cable and tensioning elements. West light floods the room with the curves extending past the window, sheltering the room from the setting sun. The light will change dramatically as the day passes, and then again at night under artificial lighting. There is no way I can visualize how to respond to this before all fixtures are installed, as well as the ceiling skin. A 4th site visit revealed a lot of progress on the facility. Signage is up, walls are painted. It's a really beautiful structure. The walls are sweeping, covered partially by sound insulation. The natural light floods the room though no sun will penetrate directly into the room. These are the ventilation blowers which will pull recirculated air from the building into this space, and up and out above. The ambient air will move the suspended butterfly elements. The first stage in the installation of the butterflies is to attach the amazing tensioning devices by Arakawa into the reinforced walls. Each device is anchored through the drywall and sheet metal reinforcement by specially designed mollies. The steel cable is pulled through each device and can be adjusted as needed before, during and after the installation of the butterflies. The drop ceiling is 17' from the floor. Rick Jacobs is helping me on this phase. We have to position the cables to allow for future maintenance access. The tape on the walls tells us where the reinforcement has been installed. I've added a few butterflies as tests. The Monarch butterfly is the inspiration for this sculptural installation. The Monarch represents the ideas of migration and transformation, of memory and the drive to connect with our origins. This tiny butterfly undergoes a journey of 2,000 miles over nine months. It weighs three ounces. Remarkably, there is no human explanation as to how it accomplishes this tremendous feat. Valley Hi Library is a stunning new LEED building. The project is funded by the Sacramento Metropolitan Arts Commission. I've created an installation in the Children's Tower, a space that is part of the ventilation system as air moves through, up and out. The space is unique, an oval 16' wide with a drop ceiling at 17.' To read about the project chronologically, click on the phases below. Your comments are appreciated.